Olivia and Neo continue eating their BARF food, even though they’re a bit skeptical to the last batch that we did. Unfortunately we haven’t been able to find out why… Sometimes they’re just too much cats! Find the basic recipe here. But now it was time to do a new one. Instead of using the large amount of minced meat that we usually do I decided to use pieces of loin of pork and chicken wings. The largest bones in the chicken wings went to the freezer waiting to become bone broth since the cats haven’t learned how to eat them. However, the smaller ones that I was able to chop with the knife went into the BARF batch. Interesting to see whether or not they will try to eat that. The ingredients for the BARF. 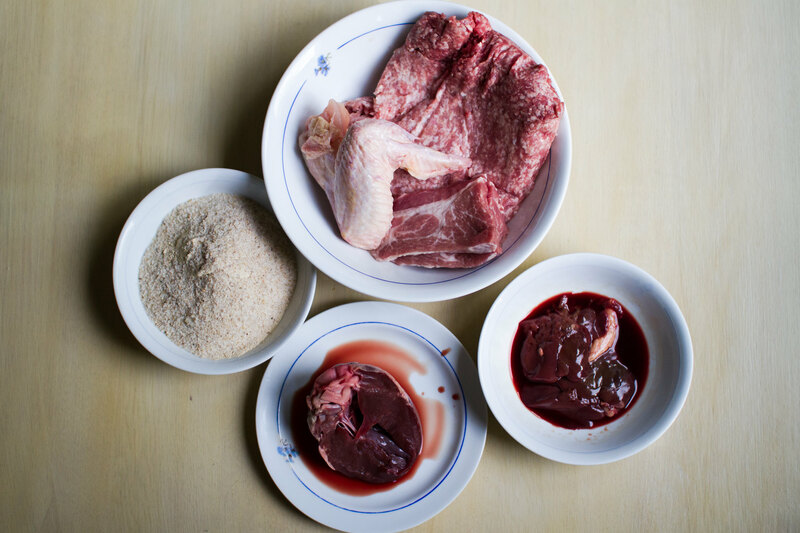 The bone meal and psyllium husk is mixed together with the minced meat with enough water to make it go together. The other pieces of meat was chopped in quite large pieces. Add the BARF mixture by portion size into jars and store in the freezer. The BARF ready to be placed in jars. Caution: Never give cooked bones to your pet, only raw ones! If they are cooked they easily split into sharp bits that can damage their guts badly. The raw ones have another texture, which doesn’t pose the same potential problems.